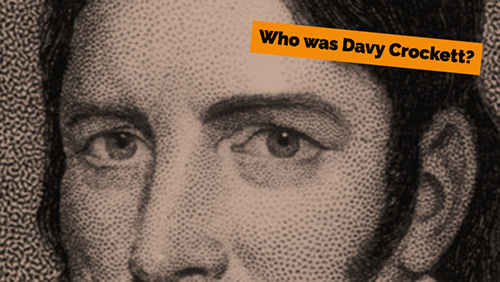 Who was Davy Crockett? This is a difficult question to answer. Davy Crockett wore a lot of hats — not just a coonskin cap. He was a famous hunter, a charismatic politician, and a war hero. Some people know him for his legacy — his fight for the fair treatment of the poor and his participation in the Texas Revolution. Others may play down his historical significance, regarding Crockett more as a poster child of a new American culture emerging on the frontier. But yet seeming to collide with the quintessential frontiersman image, are all of those things that make him seem more like an outlier. He was the only congressman of Tennessee to vote against the Indian Removal act — an action that lead to his political ruin. With that said, over emphasizing what makes an individual unique can be misleading. He may have voted against the Indian Removal Act, but on the other hand, he was no Indian rights activist. He only briefly mentions this social issue in his autobiography. What he does spend a lot of time talking about is how proud he was of his prowess as a hunter. Every angle we take, excludes something important about his identity. The challenge I want to take up with this blog post is to synthesize all aspects of this fascinating individual, resulting in a more holistic narrative. Ultimately we are left with four perspectives when examining any person’s LIFE. Looking at someone’s legacy is nice because we can really explore their real impact on the world we live in today. The only problem is a lot of times this is not what historical figures are actually known for. If we just look at someone’s legacy, we will never know what made them into a historical figure in the first place. Examining the influences of someone’s life can be useful too. We can try to understand why they made the choices they made. Or why they thought the way they did. The problem with this perspective is that it removes free will out of the equation. We forget that the person we are studying was an individual with their own unique style. Feats are the fun facts that usually come up in trivia games. I suppose they are the most entertaining to discuss — all those accomplishments that were unexpected or unprecedented. The serious problem with this perspective is a lot of times these “achievements” are inconsequential and overshadow what the person actually did. Perhaps learning about a person’s endeavors, what he or she was actually trying to do with his or her life, is perhaps the most personal way of looking at someone’s life. We can understand what they would have wanted the world to know them for. But at the same time, why does this really matter? Well, as you will see, I think all of these angles matter. I was not willing to pick one. To tell the epic story of a hero, we really have to look at every perspective of their LIFE. And that’s what I intend to do with this blog post in regards to Davy Crockett. I hope you enjoy! James Crockett, the son of Scots Irish immigrants, sits on the outskirts of a Cherokee town situated along the banks of the Tennessee River. As a captive, his one function and one function only is to clean and repair rifles and muskets for the local warriors. Deep in Indian territory — perhaps the only white man within a hundred miles, James can’t help but gaze upstream and wonder if his family is still alive. Due to natural defects he is unable to hear the gentle flow of the river, but he can feel the pulse beneath him. The horror of the raid that cost him his freedom is four years in the past, but at this point it is hard for him to tell whether he has been separated from the settlements for years or decades. He remains physically unharmed, but emotionally broken. His interactions with other human beings is limited. Before the outbreak of smallpox, he enjoyed playing with the children of the village. Those days are over. Today his only distraction from the melancholy is an uncharacteristic abundance of rifles that have been entrusted to him. The more he thinks about where the rifles came from, the more the pulse of the river seems shake with violent intensity. Dragging Canoe, the leader of the Chickamauga Indians, can also feel the violent pulse beneath him. The Chickamauga were the clan of Cherokees who refused to negotiate with the whites. Four years ago, Dragging Canoe lead his tribe further down the river away from the settlements to avoid the influence of the Overhill Cherokee. In those days, he was ridiculed by his father for throwing in his lot with the British. But Dragging Canoe had the gift of foresight that his father lacked. The neighboring Scots Irish settlers (known as Over-mountain Men) were indeed treacherous warriors, but they were weak in comparison with the Great Empire on the other side of the ocean. Once the British defeated the thirteen states way down the river and on the other side of the mountains, the Scots Irish would be isolated from their coastal allies. Indeed, the moment had finally arrived when the other chiefs would understand his vision. Dragging Canoe just heard from a Shawnee warrior who heard from a half breed, who heard from a British soldier that the coastal colonists received a devastating blow — that would likely cost them the war. At the Siege of Charleston, South Carolina the American rebels suffered the biggest defeat of the Revolutionary war. On May 7th 1780, when the Americans surrendered the port city, the British captured 5,266 prisoners, 311 artillery pieces, 9,178 artillery rounds, 5,916 muskets, 33,000 rounds of ammunition, 15 Regimental colours, 49 ships, 120 boats, and 376 barrels of flour. The red coats took less than 300 casualties. The mother of a future US president volunteered to attend to the needs of the captured soldiers who were being held in the cramped confines of the British ships. While nursing the prisoners of war, she was afflicted with smallpox and died soon after. Her orphaned son, Andrew, would never forget or forgive the heartbreak he suffered from the enemy. Retreating American soldiers from the colonies began drizzling into the settlements of the “Over Mountain Men” on the other side of the appalachians — in the disputed territories. They were greeted by John Sevier, the unofficial chief of the white settlers on the mouth of the Cherokee River — today called the Tennessee River. The fear stricken soldiers brought news that British General Ferguson would be pushing his one thousand strong army into the wilderness toward their frontier homesteads. This army was unique in that it was made up of mostly American militiamen who were still loyal to the British. The independence movement in the American colonies seemed to be losing momentum as the Loyalists began to reclaim control of the South. The Scots Irish on the other side of the mountains in Indian Territory were warned that if they did not lay down their arms they would be executed as traitors. And now the retreating coastal colonists who once refused to help the frontiersmen defend their families against raiding Indians were being asked to save them from the advance of the British army. However, the indignation felt toward the coastal colonists proved to be weak in comparison to the “over-mountain” men’s hatred of the British. Their Scots Irish grandfathers were persecuted by the crown for centuries. Now was their chance to reclaim their dignity. Rebecca Crockett grasps on to her husband’s arm and refuses to let him leave for his militia duty. She has good reason to believe that the Chickamauga Cherokee Indians who murdered her husband’s parents and kidnapped her brother-in-law four years ago would be back to raid and pillage their own homestead. She recently heard from a relative that a group of settlers moving down the Cherokee River on a raft were shot at from both sides and then raided by Indian warriors. Settlers were killed and taken prisoner. Among the survivors was future first lady, Rachel Donelson Jackson. Despite the pleas from their wives, the Over-mountain men assembled their ranks at Sycamore Shoals and departed for South Carolina, leaving their families vulnerable to Indian raids. Many of these men would return to find their wives and children murdered and scalped. But Rebecca Crockett will be one of the lucky ones to emerge from the conflict unharmed. On October 7, 1780, the “Over-The-Mountain” men caught up with the British General Ferguson at a time and in a manner that the professional commander did not anticipate. Ferguson’s army was prepared to fight in a traditional European style. The Over-mountain men learned their fighting tactics from the conflicts they had with their Indian rivals. The loyalists shot volleys of musket balls into the ranks of the over-mountain men who quickly ascended King’s mountain. This did little harm to the Indian fighters armed with their hunting rifles. The over-mountain men hid behind trees and shot down their adversaries from far distances that the musket volleys of the British could barely reach. The impatient British general urged his soldiers on to no avail. He charged forward with his horse and was shot down dead before his entire army surrendered. 668 of the loyalists were captured. Another 290 were killed. Only 28 over-mountain men were killed in the battle. After the battle of King’s Mountain, defections to the British army would end and the American patriots would re-establish their authority. The American War for independence ended in 1783. 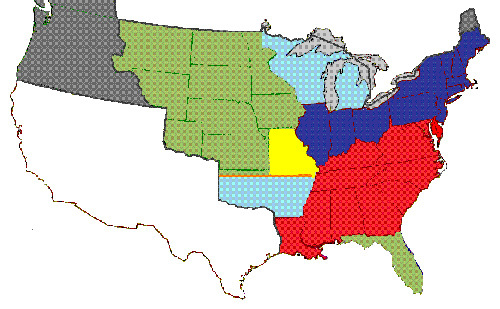 Without a central authority to acknowledge their government, the settlers who fought at King’s mountain were divided as to their relationship with the thirteen states. Some wanted to become a part of North Carolina. Others wanted to form their own separate State. Still many advocated for complete independence. Eventually they founded their own Republic called Franklin named after the famous statesman and inventor, Benjamin Franklin. The Franklin Settlers on the east end of the Tennessee River continued to be raided by Creek and Cherokee Indians. John Sevier, now a popular war Hero of the battle of King’s Mountain, lead frequent punitive attacks on the neighboring Indians. Rumors spread of his cruelty toward Indians even prompting Franklin to send a letter urging the settlers to make peace with the Natives. John Crockett, whose father was murdered by Chickamauga Cherokee, participated in many skirmishes up and down the Tennessee river. Every year the excursions became more and more bloody. So It became clear to the Franklinites that the growing conflict would continue on forever unless their land locked community was somehow supported by a powerful ally. They looked to North Carolina and Virginia for protection. But the debts that the two former British colonies racked up during the American Revolution meant that they had nothing to spare. The Franklinites established diplomatic relationships with New Spain. Some even went so far as to pledge allegiance to the Spanish monarchy so that they could have access to the Mississippi river and receive protection from the Creek Indians. The Franklinites even named a county after Esteban Rodriquez Miro, the Spanish governor of Louisiana. Meanwhile across the Mississippi river in modern day Texas, Spanish Franciscan monks struggled to ward off the brutally efficient raids of the Comanche Indians. The walls surrounding their mission were designed in such a way to minimize the threats of mounted warriors. The friendly Indians protected within its walls, once a thriving community of 300 converts, had now dwindled down to only a dozen parishioners. The chapel which began construction 50 years ago was still incomplete, as the attention of the community became more and more invested in self preservation. It wouldn’t be long before the Franciscans would be forced to abandon the mission. The Franklinites living at the mouth of the Tennessee River broke into two factions : Pro North Carolina and pro independence. The state of North Carolina attempted to reassert its authority over the settlements across the mountains. But John Sevier refused to let the state of Franklin be swallowed up by North Carolina whose interests were not aligned with the Franklinites. A civil war erupted in which two separate governments co-existed. John Tipton of the North Carolina faction accused Sevier of treason as he had indeed secretly pledged allegiance to the Spanish government. One day while Sevier was on a raid in Indian territory, Tipton had Sevier’s property and slaves seized. Sevier responded by gathering a large paramilitary unit of men and surrounded Tipton’s cabin. Tipton refuses to comply and a shootout begins. Among the participants in the conflict is John Crockett. Sevier’s men retreat when Tipton receives reinforcements. Sevier was eventually arrested by the North Carolina government, but he later escapes and is eventually pardoned. Right around the time that North Carolina was beginning to assert its authority over the state of Franklin, Rebecca Crockett, the wife of John Crockett, gives birth to their youngest son. John Crockett named his son after his father who had died ten years ago. On August 17th, 1786, Davy Crockett enters a world that is perhaps full of more possibilities than any other time in American history. The “United” states of America is still a few years in the future. The controversy over the future of Franklin has still yet to be determined. It is still unknown whether the whites and the Indians can live peacefully as neighbors. And for the first time in history, notions of democracy and the absolute sovereignty of the people are actually being applied to society. John and Rebecca gaze down on their child and think about all of the hard times they went through. If they made it this far under such circumstances, how difficult can their future possibly be? In 1790, North Carolina officially cedes its claim to Franklin to the United States Government. The region officially becomes the “Southwest Territory.” It will be split into two districts : Washington (Named after the first US president) and Miro (Named after the Spanish governor who Franklinites once courted for political support). After being pardoned by the North Carolina government, John Sevier is appointed brigadier general of the territorial militia. For the next six years the former Franklinites will have no representation in Congress. During this time John Crockett sells some of his land and invests it into a gristmill at a place called Cove Creek. The Crockett family move their children to a more comfortable plot of land that is as far away from the hostile Cherokee Indians as possible. The war between the Cherokee Indians and the white settlers will not end until the mid 1790s at the treaties of Greenville, Colerain, and San Lorenzo. John Crockett occasionally passes by the Tennessee River, formerly called the Cherokee River. Looking down stream, he wonders if he will ever see his poor brother James again. George Washington authorizes a negotiation between the settlers and the whites in the Southwest territory. However during the meeting, several of the Indians are attacked by John Sevier’s men. The Chickamauga Indians retaliate by attacking a settlement near Knoxville, Tennessee. A chief named John Watts offer the white settlers clemency. The survivors then surrender to the force of 1,000 Indians, but another chief named Doublehead begins executing prisoners. John Sevier responds by pursuing the scattered Indians who fled to North Carolina, Kentucky, and Georgia. At the Battle of Hightower, John Sevier engages in combat with the Cherokee Indians for the last time in his career. After this event, the larger battles between the Indians and the whites will be fought in the courtroom. It is sometime around this incident when John Crockett is finally able to buy his brother back from an Indian trader. Seventeen long years had passed since the horrible raid on David Crockett Sr’s homestead. James Crockett was never the same. For the rest of his life people will know him as “Dumb Jimmie.” He spends the rest of his years looking for silver and gold mines that he was apparently taken to while blindfolded in captivity. John and Rebecca Crockett would have six sons and three daughters. Davy Crockett, the subject of this blog post, was the the fifth son. The following is his earliest recollection according to his autobiography. One day he was playing with older brothers by the river. His four older brothers and another friend set off on a canoe leaving their little brother, Davy, behind. This upset him so much that when the canoe drifted off to a nearby fall he was less than sympathetic. But suddenly a neighbor, seeing the children in the precarious situation, ran to their rescue. Crockett remembers the kind man disrobing as he frantically made his way to the falls. The good samaritan stops the canoe just before it plunges into the falls. One more unforgettable childhood memory. One day when Davy’s uncle, Joseph Hawkins, was gathering grapes in the woods a hunter mistook him for a deer and shot into the lump in the woods. The bullet lodged into his body could have killed him if it wasn’t for John Crockett. Sometime after these incidents, the Crockett family move once again. John Crockett uses the little he has to invest in a grist mill with a friend. The investment looks like it will pay off. However, just as they are making the final touches, the mill floods and the water rises so high that the family has to move out of their cabin. From this point on, John Crockett will struggle to stay out of debt. John Crockett then opens a Tavern on a road to Knoxville, Tennessee. During this era in the backwoods of the Appalachian region, it was not uncommon to hire out one’s children as laborers. The Crockett family was no exception. Crockett was hired to an “Old Dutchman” who transported goods along the frontier trails back and forth from Tennessee to Virginia. This was a very traumatizing experience for Davy. He ended up living in the stranger’s home longer than what was originally agreed upon. The man offers Davy more money for his services. Too scared to decline, Davy remains there until one day he comes upon a wagoner who is on his way back to Tennessee. The man is sympathetic to Davy’s homesickness and lets him know that he was welcome to join his team on their journey back East. Davy, still scared of his employer, does not let him know of his plans to return to his parents. Davy waits until night to leave the house and catch up with the camp of the wagoner. On this particular night, there is a heavy snow shower which covers the road with six inches of snow. Davy can only make out the direction from the break between the trees in the woods. Nevertheless, Davy arrives at the wagons an hour before daylight. After a long journey, Davy eventually find his way home to the old Crockett tavern. But this will not be his last memory traveling out east. He figures that in his old age the best way to work his way out of debt is through the learning of his children. However, Davy only attends the school for four days before he gets picked on by one of the older kids. Crockett knowing that he can’t stand toe to toe with the larger student devises to a plan to ambush his adversary. Davy waits on the side of the road for the bully and his friends to pass by. And when the timing is right, Davy makes his move. The conflict with the bully was resolved. However, this only created an even worse problem. Davy fears the punishment of his strict teacher. To avoid punishment, he plays hookie for days and makes his brothers promise not to tell on him. However, it doesn’t take long for Davy’s father to find out. The teacher sends a note to the Crockett tavern. Davy’s father brandishes a hickory stick. Davy' sees that he can’t talk himself out of a severe whipping, so he takes off before his father can catch him. The chase lasts a couple miles, but John Crockett loses his steam. Davy, still afraid of a severe beating, decides to head out east — this time out of his own volition. It doesn’t take Davy very long to find a traveling companion. Davy enters into an agreement with another Wagoner named Adam Myers. He makes it all the way to the East Coast in Baltimore, Maryland. This experience reveals a whole other world that must truly seem surreal to him. Gazing out into the Atlantic Ocean, he sees unlimited opportunity. Davy steps out onto the deck of a trading vessel. So Davy catches up with the Wagoner who was holding onto his clothing and money. But when Davy shares his plans, the wagoner refuses to offer up his things. He tells him that he is going to bring him back to Tennessee and threatens him with the whip if he refuses to follow his orders. Somewhere on the road back, Davy slips off the wagon without any possessions, but the clothing on his back. A concerned traveler sees the youth on the road and asks him why he is so distressed. Davy shares everything. The man becomes furious and promises that he will find the tyrannical wagoner and get his money back. Davy, scared of the Adam Myers who had threatened him with his whip, begs the new acquaintance not inquire further. The man reassures Davy that he has nothing to fear. They eventually catch up with the Wagoner heading back to Tennessee. Davy’s new guardian now infuriated demands that the wagoner return his money. The man now admits that he spent it and planned on giving it back to him once they arrived in Tennessee. Davy feels vindicated, but this does not help the fact that he is totally broke. Davy’s new friend, from Pennsylvania, asked some fellow travelers for some contributions for the poor young man. They made a collection and Davy has enough to hold himself over until he finds employment as a hat producer somewhere in Virginia. Davy will remain there for sometime before he heads back to Tennessee. Andrew Jackson, a land speculator and lawyer who moved to the South West Territory seeking a new life, was one of the youngest veterans of the Revolutionary war. After being captured, a British officer commanded Andrew to clean his boots. Andrew refused. The British officer responded by slashing the young patriot with his saber. This left a scar on Andrew’s face and would become a mark of honor as he would become the most famous commander of the War of 1812. But before that, Andrew Jackson married the daughter (Rachel Donelson) of an important family in the former Franklin region. His acquired status no doubt influenced his election as a delegate to the Tennessee constitutional convention in 1796. Tennessee joined the United States as the 16th State, the first state to enter the union under the jurisdiction of the US federal government. In addition Andrew Jackson becomes the first congressman elected to the House of Representatives. From this point on Andrew Jackson will come in conflict with the most influential politician in the state, Governor John Sevier. In private correspondence Governor Sevier referred to Representative Jackson as a “Poor pitiful fogging lawyer.” Jackson caught wind of this insult and would never forgive him. Andrew Jackson eventually challenges John Sevier to a duel, a bold move considering Sevier is regarded as the de facto founder of Tennessee. Sometime around 1800 legendary pioneer and veteran of the Revolutionary war, Daniel Boone of Kentucky, swears his allegiance to New Spain after immigrating to Missouri, than a Spanish territory. The Spanish governor appoints Boone as the syndic of his region, a judge and military leader of great authority. Boone’s expatriation was no doubt influenced by the financial difficulties he experienced as a land speculator. After some mishandled land sales, Daniel Boone is burdened with several lawsuits. Instead of showing up for his court dates, he leaves his home state of Kentucky permanently. When US presidential candidates Aaron Burr and Thomas Jefferson tied in the election of 1800, everyone expected Aaron Burr to step aside for the De Facto leader of the Democratic Republican party. Aaron Burr refused resulting in a political controversy. In the event of a tie, the Constitution gives the authority to the House of Representatives to select the President. At the time, the fading Federalist party still controlled the House. While many of the federalist congressmen favored Aaron Burr, Alexander Hamilton the de facto leader of the Federalists persuaded his colleagues to throw their support behind Thomas Jefferson. According to Hamilton, Jefferson was “by far not so dangerous a man" as Burr. Simply put, he would entrust the highest political office to a statesman with wrong principles as opposed to someone devoid of any. Hamilton’s public criticisms of his fellow New Yorker resulted in an infamous rivalry. In 1801, reluctant Federalists elected Thomas Jefferson and the indignant Aaron Burr became Vice President. The election of Jefferson was later dubbed the “Revolution of 1800.” From this moment on the Southern and Western states would maintain enormous influence over policy until the outbreak of the Civil War in 1860. When Davy returns to the Crockett Tavern, he observes that there are several wagons parked outside and that there are quite a few guests inside. It appears that business has been picking up. When Davy ran away from home a few years back, Tennessee was still a part of the Southwest territory. Now it is a state. Perhaps this is one reason why the tavern seems so reinvigorated. Davy inquires as to whether there is a room available. The family is unable to recognize him because so many years have passed. Davy checks in. While the guests eat supper, at last Davy’s elder sister recognizes her brother. She springs up and embraces her brother, now a full grown man. Davy having left his family as a boy reunites with them as a young man. Proud citizens of the Union’s youngest state are elated to read the inaugural address of a fellow southerner in their local newspapers. Jefferson emphasized reconciliation, an appropriate theme for a young nation that seems to be increasingly divided. "We have been called by different names brethren of the same principle. We are all Republicans, we are all Federalists," said President Thomas Jefferson. It was expected that many more states would emerge in the West. What role the national government should play in a country consisting of semi-sovereign states would be the main topic of debate for the next 50 years. But while some Tennesseans pondered what role Tennessee would play in the future of the United States, John Crockett remained preoccupied with more local concerns. John Crockett who remained heavily in debt asks his son Davy for help. This time Davy hires himself out voluntarily to help ease his father’s burdens. Davy spends the next year or two working on farms to pay off his father’s debt. Upon completion of his work, he will return home at last a man without familial obligations. Last time he left home, he was escaping his father’s wrath. When he returned, he reconciled himself with his father. This time he left home to pay off his father’s debts. When he returns, his father reconciles himself with his son. Davy Crockett rides up to the Crockett tavern on a borrowed horse. He holds a note in his hand. At first his father thinks it is a letter requesting the payment of more debts. Davy hands his father the note and tells him it is a receipt confirming the payment of all debts. John receives the note, shakes hands with his son, and then breaks down crying. In 1803 under the rule of Napoleon, the French seize a huge chunk of land from the Spanish called the Louisiana territory. Only three weeks later, in order to raise funds for their war against Great Britain they offer to sell the land to the Americans. Thomas Jefferson recognizing that the deal is too good to pass up is torn. As a strict interpreter of the constitution, he would not be authorized to use his executive power to purchase the lands. He does anyway nearly doubling the size of the United States’ domain. This expedient and unprecedented extended use of federal authority will become the catalyst that divides the Northern and Southern states. Northern politicians argue that the constitution’s protection of slavery only applies to the original territories of the United States; whereas, Southern states will argue that creating conditions that new states should enter the union without slavery is unconstitutional. Jefferson’s broad use of federal power during the Louisiana purchase provides fuel to many anti-slavery restrictionist arguments. On July 11th 1804, Aaron Burr and Alexander Hamilton depart from Manhattan on seperate boats and arrive on the shores of New Jersey. There are many different accounts of how the duel played out. All witnesses acknowledge that Hamilton fired first. Whether he fired into the air or onto the ground intentionally as a sign that he did not wish to mortally wound his adversary or whether he missed his target will probably never be resolved. However, the result of the duel is clear. Hamilton was shot in the abdomen and died a day later. Burr, although serving out the rest of his term as US Vice President, would become a persona non grata in Washington. After being shunned by many prominent figures including Thomas Jefferson, Aaron Burr quietly headed out west beyond the appalachians and into the newly acquired Louisiana Territory. Davy Crockett, officially free from the authority of his father, works as laborer for a local farmer known in the area known as the ‘good ole Quaker.’ John Canady will play a very important role in Crockett’s life. During his employment, Canady will act as a strict paternalistic figure. He frequently urges Crockett to not participate in local corn huskings where young adolescents would hire themselves out for the day in return for an all night party of drinking and dancing. Crockett sometimes follows the advice of his religious mentor, but this doesn’t stop him from courting a young woman who he had fallen deeply in love with. One night when the Quaker was at a church gathering, Davy and another young man who he was working with hide a long pole in their second story room. At night when the Quaker is asleep, the two young men climb out the window. Borrowing the Quaker’s horses they ride ten miles to meet Crockett’s girlfriend and her sister. They carry out this romance in the night for sometime until Crockett finally proposes to her. She accepts and they plan out their wedding. However, as passionate as their relationship begins, it fizzles out in a very unfortunate manner. On the day that the two are supposed to be wed, Crockett is horrified to find that the young woman was set to wed another young man on the same day. He was being played. The heart broken Davy attributes his failures to a lack of learning. Partially for self improvement and partially to keep his mind of of his ex, Crockett enters into an agreement with the Quaker to let him work for room and board for two days of the week while attending a local school for four days to learn basic reading and math. Only a few years after the infamous duel with his political rival, Alexander Hamilton, Ex Vice President Aaron Burr is arrested while leading a paramilitary group down the Mississippi river. A letter was shared with President Thomas Jefferson which seemed to implicate Aaron Burr in a plot to invade Spanish claimed territories in a region called Tejas bordering the Louisiana territory. Rumors began to surface of Aaron Burr’s ambitions to make himself an emperor of a rival nation neighboring the United States. At the behest of Jefferson, Aaron Burr was put on trial. A young lawyer named Henry Clay from Kentucky successfully defended his high profile client, Aaron Burr. This case gave Henry Clay the momentum to make him arguably the most influential congressman in American history. Due to lack of evidence, Aaron Burr was let off. He was a free man, but this would not prevent rumors from spreading about his exploits out West. Among the rumors was that former congressman Andrew Jackson from Tennessee had been urged to prepare for a military conflict with the Spanish government. Before any of the trials, Jackson had welcomed Burr to his home. Undoubtedly, Jackson sympathized with his fellow Republican. Andrew Jackson had fought a duel and killed a man around the same time. Jackson’s political career would fare much better though. Jackson of course denied any connection with the conspiracy. Davy Crockett is at one of the aforementioned corn husking parties that the Quaker had spoken ill of when he meets his future wife, Polly. The romance develops quickly, but Crockett is not the only suitor around. To make matters worse, when the mother of his prospective wife finds out that Davy’s financial situation is less than desirable, she does everything she can to prevent the two from meeting. Even though Davy’s future mother-in-law does her best to match Polly with another young man, Polly and Davy find themselves naturally gravitating toward each other. One night when Davy is out hunting he gets lost in the woods. A situation that would normally be undesirable turns out to be Davy’s big chance when he bumps into Polly who also happens to be lost as she was searching for a horse. The two young lovers eventually find a house where they can spend the night until day night. While staying there, the two of them stay up all night chatting with each other. Once again Davy is in love and engaged. Soon after the fortunate accident in the woods, Davy sells his Kentucky rifle, purchases a horse, and rides it to his fiance’s house. Davy asks her if she was willing to carry through with their wedding plans. She agrees and mounts the horse Davy has prepared for her. The mother who had attempted to prevent the union finally gives them their blessing. The newlyweds move into a primitive cabin in the woods of East Tennessee. Crockett names his home “Kentuck” after the homeland of his predecessor, Daniel Boone. In 1809 Daniel Boone petitions congress to return his lost land that was taken from him after the Louisiana purchase. Meanwhile the speaker of the house from Kentucky, Henry Clay, is busy with more pressing matters. Clay had previously urged his fellow congressmen to only wear homespun clothing in response to Jefferson’s 1807 embargo against the British Empire. Humphrey Marshall, a fellow Kentuckian with more aristocratic tastes, was known for dressing his best in imported British Broadcloth. He criticized Clay for defending Aaron Burr, who by this time lived in self-imposed exile and was widely considered a traitor. When Marshall declined Clay’s suggestion to shed his cosmopolitan fashion, the two nearly exchange blows. The emotional confrontation results in a duel, but luckily is less consequential than the Hamilton-Burr encounter. The two men are both physically wounded by pistol shots, but they recover quickly. Daniel Boone does not receive his land claims for another five years. He will sell most of it to pay off debts owed in Kentucky. Charismatic Shawnee Chief Tecumseh tours the South West region of the United States. He seeks converts to his Pan Indian movement which seeks unite all of the Native American tribes against the encroaching white settlers. During this time, the great comet of 1811 can be seen in the night sky. This lends credence to the Shawnee leader’s insistence that a great revolution is about to begin. It has been many years since tension between the settlers and Indians has been so high. The British are now supplying the Shawnee Indians in Detroit. If they would be willing to join the resistance, the South Western tribes could likewise be supplied by means of Florida which belonged to Spain, but was often used as a port for the British. The South Western Indians were divided. Some sought to honor the treaties made with the United States, while the Red Stick Creek Indians seriously considered Tecumseh’s Pan Indian alliance. The Cherokee were particularly opposed to the Shawnee. They explicitly warned Tecumseh that if he brought his campaign into their villages that he would be murdered. The indignant Shawnee chief said that he would ride his horse to fort Detroit and then stomp his feet. At first the Cherokee were perplexed at what he meant by this cryptic saying. But soon after a devastating earthquake caused the entire United States to rattle. It was said that the natural disasters experienced all over were caused by Tecumseh when he stomped his feet in Detroit. The New Madrid earthquake would influence the opinions of the Red Stick Creeks who were still deciding what course to take. They finally decide to align themselves with the Shawnee. Daniel Boone who once fought against and lived among the Shawnee Indians, must have felt the pulsations from the Earthquake the most at his Missouri homestead located only miles away. Napoleon Bonaparte, who had by this time conquered most of Western Europe, was not satisfied with consolidating his power. He prepares even more ambitious military campaigns. The British prepare for the worse as the French Army commences its invasion of Poland and Russia in June of 1812. Dire circumstances demand bold action. The British begin seizing and searching American ships under the pretext of returning deserting seamen to their posts. Without a means to prove or deny the culpability of the seaman accused of desertion, in practice British captains end up kidnapping many Americans forcing them to fight in the Napoleonic wars. Politicians such as Andrew Jackson, Henry Clay, and John Sevier urge congress to declare war on the British. The pro war faction becomes known as the War Hawks. They were not only concerned about the raiding of American vessels, but also the weapons being provided to the various Native American tribes. After much debate, the US declared war on Great Britain. The British would now have to fight a world war on two fronts. But so too would the Americans — with the British in the East and their Indian allies in the West. The beginning of the war proves to be an embarrassment with failed objectives across the board. Henry Clay had boasted that the Kentuckian riflemen could seize all of Canada with little effort, but the Canadians proved to be formidable opponents. They were not even able to seize Detroit which officially lay in American territory. The abduction of American sailors continued and to top it all off the British successfully ambushed Washington DC. President Madison flees the nation’s capital as the nation’s public buildings are set on fire. In southern Alabama, then known as the Mississippi territory or Indian territory, there is a militia garrison called Fort Mims. One day two slaves approach the fort and warn of an encroachment of hostile Red Stick Creek Indians. The situation is inspected and no Indians can be found. One of the slaves is flogged for stirring up trouble. Soon after sometime around supper, the terrifying battle cries of the Red Sticks resounds on all sides of the fort. The militiamen move into their positions and prepare for a siege, but one of the gates that had been ill attended to was stuck open by some accumulated sand. This mistake proved to be fatal as hundred of braves surged into the the fort. Ultimately the battle resulted in the killing and scalping of more than 400 settlers. The gruesome battle did not spare women and children and the survivors’ accounts were bloody enough to send shock waves across the Southwestern United States. With the regular army preoccupied with the British, the settlers who lived among the Indians were left to fend for themselves. Militiamen of various counties assembled and formed a makeshift army of farmers and hunters. Andrew Jackson is immediately appointed to lead a 2,500 strong West Tennessee army. President Madison offered John Sevier a command in the regular army, but he had turned it down. Polly Crockett begs her husband not to leave. But Davy Crockett is determined to volunteer his services as a soldier in the War of 1812. He does his best to reason his case to his concerned wife. Crockett was well aware of the risks of leaving his family behind for a campaign, but undoubtedly he was comforted by the fact that the elder volunteers, most of whom were veterans of the revolutionary war, were left behind to protect the various families in the event of a counter attack. This generation, the generation of Crockett’s father, grew up with tribal violence on the frontier and were prepared to prevent even more heartbreak. Crockett joins a unit that would link up with Andrew Jackson’s forces. Expecting his service to only last three months, Crockett packs lightly. Crockett is part of a mounted unit that will move ahead of the main forces in search of enemy combatants. Surely his reputation as a woodsman lead him to earning this position. When Crockett is asked to choose a companion for his scouting mission, he selects a young man by the name of George Russell. The commander is surprised that he wants to bring on someone who looks like a kid. Davy was taken aback. Crockett eventually gets his way. In 1813, Mexicans lead by Miguel Hidalgo declare independence from Spain. Mexican leaders send diplomats to the United States in an attempt to legitimize their movement. Madison refuses to involve the U.S in the conflict. Eventually the rebels are cornered, their leaders executed, and the rebellion is repressed. One of the bloodiest battles is fought in the Northern region of Tejas. In that part part of the country a separatist group lead by a charismatic figure known as Jose Bernardo Gutierrez de Lara was successful in recruiting Indians, Americans, and local Mexicans known as Tejanos into his army. They establish a provisional government independent from Mexico. However, they are defeated in the bloodiest battle in Texas history just south of San Antonio and the famous Alamo chapel. The Spanish loyalist General Arredondo takes no prisoners. Thousands of bodies are left on the battlefield unburied as a way to warn others of the consequences of rebellion. Among the soldiers in Arredondo’s army is Santa Anna, the future president of Mexico. Davy Crockett experiences his first large scale engagement with the Red Stick Indians at the battle of Talluwshatchee. Here a combined force of Tennessee Militia and Cherokee Indians surround a vulnerable Creek village. The enemy is caught entirely off guard. As Davy Crockett and other soldiers fire their rifles into the village, the Creek warriors are unable to make any meaningful formations. With nowhere to escape many of the Indians retreat into their houses where many women and children also hide out. This event would leave a last impression on Crockett. He writes down the disturbing details in his autobiography. Davy Crockett spends the rest of the war fighting hunger just as much as he fights the Red Sticks. In this period of American history, the decentralized nature of the military meant that the soldiers were forced to fend for themselves. Crockett recounts more than one story where he and his companions merely starve to death. Davy Crockett misses the decisive battle of Horseshoe Bend that virtually ends the conflict with the Creek Indians. During this battle, Andrew Jackson will earn his reputation as a brutally effective general. Sam Houston, a Tennessean who ran away from home and had up until this time lived with the Cherokee Indians, would also become a war hero and later a political supporter of Andrew Jackson. While Henry Clay and future president John Quincy Adams negotiated an end to the War of 1812 in Ghent, Belgium, General Jackson prepares his resistance against an invading force of British soldiers. This is the moment that Jackson was waiting for since his childhood when a British officer disfigured his face with a sabre for refusing to clean his boots. The British land a 5,000 strong army in New Orleans, Louisiana. Jackson manages to out maneuver a seasoned General who had acquired a reputation fighting Napoleon. At the battle of New Orleans, the British army is completely demolished by Militiamen with rifles. The battle must have reminded many of the soldiers of the Battle of King’s Mountain where a haughty British General was defeated under the leadership of John Sevier. After this battle, Jackson would become a powerful political figure in Tennessee and a national celebrity. John Sevier, Andrew Jackson’s elder rival, will die in obscurity while surveying recently vacated Creek Land. Davy Crockett returns home from the war, no doubt a changed man. The joy of his reunion with Polly is short lived. She dies from an unknown disease soon after Davy gets reacquainted with civilian life. Crockett is devastated by the loss, but on the unforgiving frontier it’s not possible to slow down one’s life after tragedy. He keeps going like all frontiersmen must do. Crockett and his two small children move in with relatives. But this only lasts a short time. Davy’s second marriage was to Elizabeth Patton, a woman whose husband had died in the Creek War. It is well known that her family was well to do relative to the poverty of most Western settlers. Crockett works hard to court Elizabeth. Being a pragmatic woman with a strong business sense, she must be attracted to Crockett’s bright character and overall potential — there is clearly nothing to be said in terms of financial gain. Many veterans remember Davy Crockett for his compassion and his optimistic personality during the war. He may have not become a national celebrity like Andrew Jackson, but he had established a strong reputation in his backwoods community. Soon after his marriage he is elected Justice of the Peace in his county. One anecdote from his autobiography exemplifies the quality that must have earned Crockett trust and admiration among his peers. Crockett was often given permission to find game for the army. Davy Crockett, although lacking any formal legal education, becomes the judge and authority in his modest community. This is the start of his political career. Although, Davy would like to spend his days hunting, Elizabeth urges her husband to seek a more stable profession. With Elizabeth’s savings the two are able to move to a new plot of land near the Tennessee river at a place called Shoal Creek. They construct a gristmill, distillery, and a gunpowder factory. With this big move, the couple and their children are well on their way to living the American dream. Despite the economic panic of 1819 that lead to large-scale bankruptcies and high unemployment due to excessive land speculation and loose lending policies, the Crocketts will end the decade full of optimism. Not only are they engaging in promising new business ventures, Davy Crockett seems to be destined for a successful career in politics. In these days, it was not uncommon for many statesman to launch their political careers by campaigning for a position in the local militia. It was a long held belief from proponents of the Jeffersonian ideology that a standing army was dangerous to democratic republics. The need for a powerful standing army was not felt until the war of 1812 where the South West theater had to rely on militia who fought bravely, but were ill equipped and underfed. Nevertheless, the United States army would remain tiny compared to European countries all the way until the Civil War. Consequently it was considered a duty of all conscientious Americans to be a part of the State militia. Here high ranking leaders were democratically elected. During times of peace their main duties were to organize a drill at least once a year. Some of these gatherings could become quite informal and turn into an excuse to socialize. It wasn’t uncommon for men to drink late into the night and participate in shooting matches. In the case of the latter, Crockett was a regular participant and had developed a reputation for his superior marksmanship. His prominence at these gatherings no doubt contributed to his election as a Colonel. Soon after he receives this honor he announces his candidacy as a state legislator in the general assembly. His opponent is a competent, but aloof figure that Crockett is able to brand as an aristocrat who was disconnected from the common people of his district. Indeed Crockett is one of the first politicians in history to use his opponent’s perceived affluence as a way to show a disconnect from the common people. He wins the hearts of his constituents and in 1821 he is off to the state capital of Tennessee in Murfreesboro. Daniel Boone died a year before his adopted home of Missouri entered the union as the 24th State in 1821. Missouri’s entrance into the Union was very controversial as it divided Southerners from Northerner over the issue of slavery. Many Southern politicians insisted that the State had the right to decide whether to allow slavery or not. Other northerners insisted that all new states should enter the union under the condition that they will not permit slavery. Both sides of the debate focused on their interpretations of the constitution. Tensions were high and it seemed as if unresolved issues would result in the fracturing of the federal system. Henry Clay, the famous orator and speaker of the house from Kentucky, is able to work out a compromise which would be able to alleviate the tensions at least for a while. Massachusetts would partition off their northern territory to make the state of Maine. This insured a balance of free states to slave states. Politicians of the time were very much concerned with balancing the power between regions. Southerners were worried that if they lost their majority in the senate that Northern politicians would attempt to amend the constitution to forbid Slavery. In Crockett’s congressional district, there is a constant tension between the interests of the the slaveholding elite heavily invested in cotton production and the poor subsistence farmers who are barely able to get by. As Indians are forced off their lands, many poor farmers occupy vacant property. They work the land, but are unable to purchase it. Land speculators purchase the land in large quantities and then sell it back to poor farmers. Crockett’s constant struggle as a congressman is to make the land affordable for those squatters who are forced to take out loans to purchase the land they live on. During one of the debates, a fellow congressman who apparently is a man of much wealth refers to Crockett as “The Gentleman from the Cane.” The cane is a reference to the bamboo like plant that grew ten feet tall and could be found in the backwoods region of Tennessee at the time. Crockett takes offense to this nomenclature and demands an apology threatening his fellow congressman with a good ole country thrashing. Crockett latter finds a scarf on the ground similar to the one that the well dressed rival wears around his neck. During a debate, Crockett pins it to his course shirt and paces back and forth as he delivers a speech. It quickly becomes apparent that Crockett is mocking the mannerisms of the congressman who had wounded his pride. The assembly erupts in laughter and the embarrassed congressman leaves the room before they convene. Crockett establishes his reputation as the Gentleman from the cane. He is loved by his constituents because of the way he exposes the absurdities of elitism while sticking up for the interests of the poor. In 1821, Mexico finally wins her independence from Spain. It is during this time that Stephen Austin receives permission to settle the Northern state of Tejas with “Anglo” settlers. Austin, a loyal citizen of the new republican country, has exclusive authority to receive immigrants into the region. A few years later in 1824, the republic establish a constitution similar to the United States in many ways, but dissimilar in that it strictly forbids slavery. The American immigrants who brought their slaves to Tejas are warned that they must free their slaves by a set date. Conversion to Roman Catholicism is also a requirement. Settlers for the time being are not forced to stop their protestant traditions. In the same way, they find convenient loopholes to continue the practice of slavery while not stirring up trouble with the Mexican government. Congress is in session when Davy Crockett learns the horrible news that his gristmill was destroyed in a storm. Crockett is reminded of a similar fate that John Crockett, his father, experienced when he was a boy. Just as Crockett is experiencing his big break this, tragedy will cause him to struggle financially for the rest of his life. Crockett is forced to sell all of his property to pay off his debts he acquired from the expensive construction of the gristmill, distillery, and gunpowder factory. Within twenty four hours, Davy Crockett’s prospects as a businessman come to an end. He is forced is move further out West to a small plot of land acquired from Crockett’s father-in-law. For lack of any other options to support his growing family, Crockett returns to the one thing that he knows he is good at — hunting. Davy feeds his family with the meat he acquires from his hunts and sells the furs once they accumulate enough to bring them to market. However, fur trading will not be enough to keep Crockett out of debt. From this moment on his relationship with his wife will become more and more volatile and Crockett will spend more and more time in the woods so as to avoid lawyers and creditors. It would seem that at this point in our story, Crockett is destined for obscurity. The 1824 presidential election is unique for many reasons. It will be the last election not driven by party politics and the last time the president is selected by the house of representatives (the last time this happened was with the controversial draw between Jefferson and Burr). Since George Washington became president in 1789 all presidents had been from Virginia except for John Adams. This election would represent an important power shift. The election pitted many powerful figures against each other : Henry Clay, John Quincy Adams, William H. Crawford, and finally Andrew Jackson. Since the Electoral college requires a majority to be elected to the presidency, this line up of famous statesmen meant that the election would inevitably be determined by the House of Representatives which Henry Clay controlled. Andrew Jackson was a huge upset for Henry Clay who thought he was destined to be the first president from the Western states. However, Henry Clay came in fourth and the constitution permits congress to select the president from the top three candidates. Ultimately Clay is able to hand pick the next president, but not become president himself. In those days, it was thought that the Secretary of State was the natural heir to the presidency, as most of the previous presidents had previously held that position. Henry Clay used his influence to get John Quincy Adams elected. And immediately afterwards he was appointed Secretary of State. As Secretary of State, one of Henry Clay’s main objectives is to improve relations with other emerging American republics. With Latin American countries such as Mexico winning their independence, the Congress of Panama was called to unite the interests of the Western hemisphere. Henry Clay was adamant about sending delegates; however, slaveholding interests prevented the United States’ participation. Haiti, a former slave colony which had which had been founded by revolting black slaves in 1804, would be among the countries present at the congress. Slave holding states became concerned that participation would undermine their interests and cause slave insurrection in the Southern States. Although, Clay was successful at negotiating a lot of important treaties with Latin American countries, he is unable to acquire the support he needs to send a delegation to the conference. It was during this time when voter participation peaked just before the 1828 election when three prolific Tennessee statesmen would emerge all as Jackson supporters : Sam Houston, James K. Polk, and Davy Crockett. Sam Houston, a hero of the war of 1812, became Governor of Tennessee with the support of Andrew Jackson. Houston was unique in that he was an adopted son of the Cherokee people while at the same time being a firm Jackson supporter. Like Crockett, he sought to improve the plight of homesteaders by lowering the price of land for the poor. James K. Polk, who would later go on to be US president, sought to abolish the electoral college system by capitalizing on the controversy over the “corrupt bargain.” In 1827 he was re-elected as a congressman and continued to be a thorn in Henry Clay’s side. Davy Crockett who had disappeared into the western region of the state, suddenly re emerged as perhaps the most populist political figure in US history. Crockett was critical of the aloof John Quincy Adams who he regarded as a corrupt aristocrat. Crockett, without much political backing, was able to campaign on the belief that the poor citizens of the state should have one of their own represented in national politics. Meanwhile, John Ross was elected chief of the Cherokee nation. Under his leadership a constitution was drafted. As a nation who fought on the side of the Americans during the war of 1812, he would seek recognition as an independent republic from the United States government. The 1828 election witnesses the emergence of party politics. Martin Van Buren, known by his opponents as “the little magician,” applies what he had learned about the power of party politics during his political career in New York to national politics. Buren believed that sectionalism between regions had to be checked by organized parties. He was instrumental in passing the tariff of abominations before the election of 1828 which was designed to unite the passions of yeoman farmers in the north and Slaveholders in the South. Throwing his support behind Jackson, his political machinations were extremely successful. Jackson won with 178 electoral votes against Adams’ 83 electoral votes. This election experienced unprecedented voter turnout which is why this election is sometimes referred to as the beginning of Jacksonian Democracy. Upon inauguration, mobs of common people flood into the White house. Many American citizens who previously felt like they were ruled by an aristocratic elite felt like they had their popular champion as president. As the president of the United States, Andrew Jackson’s first agenda is to negotiate the removal of Native Americans from their lands in the Southeast United States. This stance is very popular for both the poor seeking affordable land and for rich land speculators looking to invest their money in land that can be used for cotton production. At the end of the 1820s, Sam Houston who had previously appeared as if he would be Andrew Jackson’s heir suddenly disappears. He resigns as Tennessee’s governor after a marriage to the daughter of a wealthy planter falls apart almost immediately following his wedding night. Various rumors spring up throughout the state. He threatens violence against anyone who would question the chastity of his ex-wife. Houston crosses the Mississippi river into Cherokee territory. Here he develops the reputation for being a heavy drinker. Meanwhile, Davy Crockett is introduced to an elite society that had been previously totally unknown to him. He mingles with congressmen from all over the United States. He is as fascinated with them as they are with him. People are charmed by his adventure stories of bear hunts. He is eager to learn about the new industries emerging in the north. He learns about new cotton mill technologies, railroads, and the recently completed Erie Canal which connected the Atlantic ocean to the great lakes of the northwest. But before he can satisfy all of his curiosities about the Eastern states, congress must open. Crockett begins his national political career optimistically. He immediately begins networking to garner support for a land bill that can alleviate his poor constituents. Crockett is only in Washington for a very short time before he becomes disillusioned. An article appears in the newspaper which paints a very undignified portrait of Crockett’s mannerisms. An anonymous writer suggests that while at a political event, Crockett drinks from a bowl used for people to wash their hands. In addition words are even put into Crockett’s mouth that he complained about a waiter stealing his plate when actually they were simply clearing the table for the next dish. The furious Crockett is so sensitive about the article that he gets two of his colleagues to write counter articles which state that Crockett did not in fact do the things that he was purported to have done. Crockett tries to acquire support for his land bill, but finds that lawmaking is much more complicated on the national level. He is disgusted by the behavior of his fellow congressmen. The Tariff of Abominations was passed under President John Quincy Adams, but is ratified under Andrew Jackson. The law which taxes imported goods so as to protect American goods is a boon to the North, but damaging to the Southern cotton exporting states. Vice President John C. Calhoun and other politicians from South Carolina regard this as unconstitutional because the law seems designed to favor certain regions. The discontent of South Carolina leads to the nullification crisis where Calhoun argues that the constitution is a compact between states and that states may nullify laws they regard as unconstitutional. Secessionist sentiment grows in the state and will remain until the Civil War where South Carolina leads the way to secession. In other words, Andrew Jackson established the precedent that the federal government could use military force against a state that refused to enforce federal law. The irony here is that he refuses to enforce federal law that protects the American Indians against a State’s seizure of their property. While Andrew Jackson may have been responsible for preserving the Union of the various states, he was also responsible for severing many Indian nations from the USA. While he threatened military intervention against South Carolina, he would not act on behalf of the Indians who were being forced off their lands in Georgia. In the late 1820s/early 1830s gold is discovered in Northern Georgia resulting in the first Gold rush. However, the land that contained the gold reserves happened to belong to the Cherokee. President Andrew Jackson warns the Cherokee that the federal government cannot intervene on their behalf and that the best course of action for them will be to remove themselves to the other side of the Mississippi river. The Cherokee, who by this time are very politically organized, fight hard for their rights. Even despite the pressure from the Supreme Court, President Jackson refuses to enforce the law. Eventually a bill is proposed in congress that will authorize the president to make treaties with the remaining Indians to remove them to western lands. Davy Crockett is the only congressman in the Tennessee delegation to vote against this bill. This amounts to severe political repercussions. The bill is popular among Crockett’s constituents, but nevertheless he votes against it. From this time on, Crockett will be regarded as an enemy of Andrew Jackson. In the 1831 election, Crockett is voted out of office. To make matters even worse his wife Rebecca moves off of their homestead and Crockett is left alone to fend for himself. Once again it would seem as if Crockett’s political career is over. Crockett accepts his fate and once again turns to hunting for subsistence. However, Crockett receives a second chance. A playwright named James Kirke Paulding enters a script called “Lion of the West” into a competition sponsored by the then super famous actor James Henry Hackett. Soon after this exchange, “The Lion of the West” explodes becoming the most performed play in the USA until a dramatization of Uncle Tom’s cabin premieres in 1852. People simply cannot get enough of Nimrod Wildfire who everybody knows is inspired by the eccentric congressman from Tennessee. It doesn’t take long before a popular unauthorized biography is released and becomes equally popular. Crockett who thought he would never enter politics again is re-elected to a brand new district out west. Crockett returns to Washington more than just a curiosity or a local hero, but as an international star. Crockett eager to get himself out of debt seizes on a new business opportunity that he didn’t consider before. Crockett, even though he is partially illiterate, endeavors to write his own autobiography. He receives assistance from a fellow congressman named Thomas Chilton, but if you read the autobiography it is clear that the words of Crockett are authentic. Crockett then proceeds to go on one of the first book tours in American history. For the first time, he visits “The North” and sees for the first time many of the technologies he had only heard about from his Washington friends. He rides a steamboat, visits a shoe factory, and dines in some quaint New England villages. Crockett’s writings on the experience reveal that he was enamored with New England culture. Once critical of Yankees such as John Quincy Adams, Crockett has much words of praise for the Northerners’ hospitality and work ethic. He seemed to be less enthusiastic about his stop in New York city where he was critical of the Martin Van Buren supporters who was about to run for president as Jackson’s heir. Due to this tour, Crockett became associated with the Whig party even though he never called himself a whig himself. Crockett continues to try to push his land bill while he is congress, but his time spent in the Yankee states is considered a betrayal by many of his constituents. Just as Crockett rebounds from his previously fall from grace, Crockett must once again defend his principles against the political machine built on the popularity of Andrew Jackson — but perfected by the ingenuity of Martin Van Buren. Crockett campaigns hard not only for his re-election, but also against Martin Van Buren who Crockett regards as the puppet master who was able to manipulate Andrew Jackson. It is clear Crockett made no pretensions to be a literary genius, but he seemed to be passionately against what would later be articulated as party politics. Without a firm political backing and effectively isolated by his opponents, Crockett is once again voted out of office. Just like many of his contemporary poor frontiersmen, when trapped in dire economic circumstances, there was but on choice —move further West. Crockett who was barely getting by in Western Tennessee, living apart from his wife and children and constantly fighting debt, decides to take a trip to Texas. It is very likely that he heard from his acquaintance Sam Houston of a civil war that was breaking out in Northern Mexico. It was well known that General Santa Anna had nullified the 1824 constitution making himself a dictator. Mexico was a federalist nation like the USA that had states with regional loyalties. Santa Anna sought to consolidate his power. It was very challenging to get any more than lip service from the various governors of the Mexican states. In the north not only were the local Mexicans (called Tejanos) known for being rebellious, but the American immigrants flooding into Tejas seemed to be a problem that needed to be dealt with quickly. Americans like Davy Crockett were being offered large tracts of land if they would join the Texas Revolution. Among the leaders of the conflict were Sam Houston who favored total independence from Mexico while Stephen Austin tried and failed to reconcile his colony with Mexico city. As more and more politicians leaned toward independence, Davy Crockett crossed over the US-Mexico border. As he hunted for buffalo for the first time, Halley’s comet could be seen shining brightly in the night sky. Mark Twain, the author who would be highly influenced by Western folklore, was born at this same time in Missouri. Soon after Crockett arrives in Texas, he volunteers to fight in the Texas army. He is offered a high ranking position, but he turns it down and insists on holding the rank of private. A church called the Alamo located in San Antonio is transformed into a fort. Crockett joins James Bowie of Louisiana and William Barret Travis of Alabama in a siege that would be memorialized until this very day. Santa Anna marches his army into Texas and surrounds the Alamo fort with almost 2,000 soldiers. The Texan volunteers number between 185 and 260 soldiers. Among them are American settlers who have been in Texas for many years, some of them are Tejanos disillusioned with the Mexican government, and many are like Davy Crockett who have only been in the country for a short time. Santa Anna surrounds the fort and for 13 days the Texans fight off their Mexican adversaries. But ultimately the fort cannot resist the numerically superior force. Santa Anna orders a large scale siege which results in 400-600 Mexican casualties. No Texans are taken prisoner including Davy Crockett. The Texans’ bodies are all burned. Soon after Santa Anna marches his army north toward Sam Houston who now became the sole commander of the remaining Texan forces. Up until this time, the Texans had won no large scale victories. Santa Anna had good reason to have confidence that he would be able to drive the remaining revolutionaries out of Mexico. Sam Houston who had been criticized for not reinforcing the Alamo and resisting a direct battle with Santa Anna struggles to control his army of volunteers. Houston retreats with his army toward the US border perhaps intending to provoke a war between the US and Mexico. He cannot hold his army together much longer though. The Texans are eager to fight as soon as possible and Houston does not have the authority to prevent factions from acting according to their own will. Houston realizing he cannot delay the war much longer, chooses the battle ground of San Jacinto where he would finally let his volunteers go. He acted on intelligence that the enemy had recently received reinforcements, but that they were worn out from a long journey. A reluctant Houston orders an all out attack on Santa Anna’s camp. A defeat will probably mean the loss of the war. However, the attack is extremely successful. The Texan army catches the Mexican army while they are sleeping. Within 18 minutes Santa Anna’s army is obliterated with 650 killed, 208 wounded, and 300 captured. Sam Houston’s army takes only 41 casualties making the Battle of San Jacinto one of the most lopsided victories in modern military history. As the Mexican soldiers are shot down, the Texans shout “Remember the Alamo.” Santa Anna is captured while disguised as a low ranking soldier. While in captivity he is forced to sign a treaty that acknowledges Texas as a sovereign nation state. Sam Houston will go on to become the first President of Texas and then later on he would resign his governorship of the State of Texas when he refuses to support the Confederacy on the eve of the Civil War. Soon after the decisive Texan victory, a fake autobiographical account of Crockett’s time spent in Texas is published. Much of the mythology regarding Crockett’s participation in the Texas Revolution will be informed by this work. In 1837, the Crockett almanac becomes a huge success. It features stories that depict Crockett as a proto super hero, a man who could ride comets and kill raccoons just by grinning. While David Crockett was a hero in his own right, “Davy” Crockett, the legend, will be the hero who will become a symbol of the American West and manifest destiny. By the time Crockett died, the USA had very quickly shifted from a developing nation to a major world power that needed its own mythology to distinguish itself from the old world nations. Crockett provided the nation with a hero who was one hundred percent unique to America. His appearance and mannerisms were distinctly American. And his martyrdom at the Alamo would only cement his place in the pantheon of folklore legends. Only a year after Davy Crockett’s death, his son finishes his father’s work in politics. John Wesley Crockett, no doubt named after Davy’s father, defeats his father’s bitter rival, congressman Adam Huntsman of the twelfth congressional district in the house of representatives. John Wesley, unlike his father a professed whig, passes a land bill similar to the one that his father had proposed. After two terms in office, John Wesley will go to become the Attorney General of Tennessee before settling down as a merchant in New Orleans. Like his father he will die early at only age forty five. Whether the Republic of Texas would be annexed becomes the next hot topic in American politics. Northerners try to block Texas from becoming a state because it will expand slavery even further when many people had expected the practice to be contained. Martin Van Buren becomes an anti-annexation leader which leads to a falling out with Jackson’s democratic party. Martin Van Buren will go on to lead the Free Soil party. Andrew Jackson throws his support behind his two loyal protege, James K. Polk and Sam Houston. These two Jacksonian democrats will be the driving force behind what pro-expansionists will refer to as Manifest Destiny, the idea that the US was destined to occupy the North American continent. Despite Northern resistance, the threat of the British aligning themselves with the Texas Republic was enough to persuade American political leader to support annexation. Texas becomes the 28th state on Dec 29th, 1845. Just over one year later, the US will provoke a war with Mexico. Santa Anna will once again lead his armies against Americans. So many Tennesseans volunteer to fight that they earn the nickname, the Volunteer State. Generals Winfield Scott and John Taylor prove to be very effective leaders. After two years, Mexico is forced to give up their territory south of the Rio Grande. The humongous acquisition of land makes a conflict over the spread of slavery inevitable. Tensions between the North and South Rise. Fifteen years later, many of the veterans of the Mexican-American war will take on leadership positions on both the side of the USA and the Confederacy. In 1854, Elizabeth Crockett receives the land promised to her for her husband’s role in the Texas Revolution. She moves to Texas with some other family members. She will wear black for the rest of her life until her death in 1860. Sam Houston and Martin Van Buren will both die half way into the Civil War not knowing whether the Union they fought so hard to preserve would survive. John Ross remains chief of the Cherokee until his death in 1866. They for the most part side with the Confederacy, but still many join the side of the Union. The Cherokee splinter at the end of the war and try to negotiate two seperate peace agreements. The play focuses on a romance between Davy Crockett and his love interest who returns from a trip abroad with her guardian and fiance. It is found out that the Uncle was in fact forcing the marriage and Crockett is forced to fight for his childhood sweetheart. The play reaches its 1000th performance by 1877. The actor playing the role of Davy Crockett, Frank M. Mayo, is so typecast as Davy Crockett that he has a difficult time trying to play anything else. This actor will convince Mark Twain to let him adapt “Pudd’nhead Wilson to the stage. No doubt he expressed his frustrations about being typecast. Mayo laments that a fan approaches him and asked, “I don’t suppose you’ll ever else, but Mayo, Mr. Crockett?” Mayo’s son also has success playing the role and the play would be made into a silent film in 1916. “Martyrs of the Alamo” is a fifty minute silent film depicting the events leading up to the Texas Revolution and then the siege of the Alamo itself. The movie was produced by DW Griffith, the director of “Birth of a Nation,” and released the same year in 1915. The film focuses around the race relations between the white settlers and Mexican military officers, featuring many of the same racially driven themes as the more popular “Birth of a Nation.” Davy Crockett does not in fact appear as a prominent character. At the end of the siege of the Alamo, there is a scene of him trying to sneak away after the fight. This is an interesting detail as questions as to whether Davy Crockett surrendered at the Alamo wouldn’t surface until the 1970s. The peak of Davy Crockett interest of among youth was perhaps never greater than in the 1950s. The theme song of the movie also became super popular — so much so that the sale of Coonskin Caps soared throughout the 1950s and 60s. The movie and TV series launched the career of Fess Parker who would go on to play Daniel Boone in a subsequent TV series. Parker’s role in both Davy Crockett and Daniel Boone series contributed greatly to the confusion between the two legendary figures. While the Davy Crockett buzz was still strong as ever, John Wayne released his version of the Texas Revolution story with his directorial debut film, The Alamo (1960). Like “The Martyrs of the Alamo,” this movie focuses on the events leading up to the siege and then the siege itself. However, Crockett played by John Wayne himself is clearly the main character. The movie had a highly publicized premiere, but it did not receive the critical acclaim that Wayne was hoping for. Did Davy Crockett die fighting at the Alamo? Or was he executed? This is a question that has caused controversy since the 1970s. During that time a journal entry from a Mexican lieutenant by the name Jose Enrique de la Pena surfaced which seemed to provide strong evidence that Crockett was captured during the siege. This outraged many “Davy Crockett : King of the Wild Frontier Fans” because they felt like the new finding was a smear on their heroes’ reputation. Many books were published just on the topic of Crockett’s death alone. Some people claim the journal was a fraud while others point out that it wasn’t the first account which pointed to Crockett’s execution. In 2004, a remake of John Wayne’s “The Alamo” premiered and received mediocre ratings. Dennis Quaid plays the role of Sam Houston and Billy Bob Thornton was cast as Davy Crockett. In 2018 Brian A. Crandall (Director of Lost Boys and An Unforgettable Day) launches his first podcast called “Davy and Me.” The podcast explores Crandall’s childhood fascination with the frontier hero as well as his conviction that adults need role models just as much as kids do. The inspiration from the audio narrative comes from Brian’s rediscovery of Davy Crockett while doing some research for a movie script. Read : “Davy Crockett Podcast?” Producer shares the background story. While at one time, Crandall was disillusioned with the revelation that Crockett probably did not go down fighting at the Alamo, he discovers something way more profound about the real man. He finds that the real Crockett was just as much a hero as the legend albeit in a different way. The “Davy and Me” podcast now has a new home on the Hero and Me podcast brand which explores the lives of exceptional role models. Looking at the life of Davy Crockett -- you'll see a man who lost A LOT. He was a politician who failed to pass a land bill that would make it easier for the poor to own their own property. He never quite got that done. He resisted the Indian Removal of the Cherokee. The infamous Trail of Tears is a disturbing reminder of his loss there. He attempted to be a founder of a republic and got himself killed before that could come into fruition. In many people's' estimations he would be considered a loser. But yet he is not. It's not that he managed to get himself famous that makes up for his shortcomings. It's that despite of his mistakes he kept on moving. He didn't like losing, but he knew when he lost and when he did he stayed in motion. He had a whole list of things on his bucket list he wanted to do. I am not sure if he crossed out any of them. But yet doing research on his life and reading about how he lived it, it is clear that in pursuit of them he impacted the world in ways he never anticipated. He inspired his peers, showing them that whatever economic conditions they were in they could achieve their most lofty dreams. He forced people in power to consult with their conscience and show that their sins would not go unnoticed. He told stories to thousands of people on a personal one on one level. This penetrated farther west than any pioneer and in fact changed the way we speak English, arguably to the same extent as William Shakespeare. The examples of his triumphs are of course much more difficult to measure than his failures. But they are more important. This is not to say that accomplishing one’s goals is not important. On the contrary, all people destined for greatness have goals and are upset when they don't accomplish them. But great people like Davy Crockett know their values and keep going regardless of their failures. They can and do come up with explanations, but they don't dwell on them for too long. Like the frontiersmen and women of the 1800s, they are proud of the opportunity they have to struggle knowing the whole time that "sometimes you eat the bear, but other times the bear eats you!"